Great ideas to feed a large family. Love the setup of this system. Building AP systems and teaching Aquaponic Basics, I am always looking for new ideas. Tuesday was such a good day. I surprised my husband with all day babysitting for three of our kids and we took off to do all of our shopping. Yeah, not the best date ever, but those of you with kids understand how hard it is to go shopping with them! 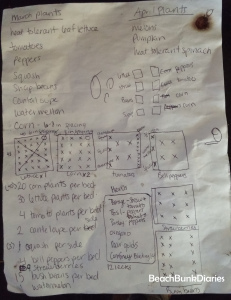 This is what my “planting guide” looked like. It gave me a rough idea of how many plants I wanted to purchase and approximately where I wanted to put them. The paper ended up wrinkled, wet and with a sap drip because of being outside with us all morning! Previous PostAquaponics-Supercharge plant growth with teaNext PostCamp, fish, hunt, prepare-You Need This!